Crank up the rumor machine, kiddos -- it's déjà vu all over again. In case you haven't heard, one of the tech world's favorite on-again, off-again topics has been resurrected. Yep: It's the seemingly immortal "iPhone on Verizon" buzz, back in the news yet again. This time, a report in The Wall Street Journal is reigniting the Verizon-iPhone flame. The story, originally published on Monday, cites the always-popular "people briefed by the company" as saying Apple will produce a CDMA-ready version of its iPhone sometime this year. The new iPhone, the Journal suggests, will be aimed directly at Verizon. Hang on, though: Before you roll out the nearest welcome mat, there are a few things you may want to consider. When a story quotes nameless people and provides no further evidence, it's tough to evaluate the reliability of its information. Sure, it could be dead-on -- but, as we've seen plenty of times in the past, it could also be complete hogwash. Me, I like to treat these types of speculative stories with a healthy dose of skepticism. Until there's any concrete reason to believe something, it's ultimately all just hearsay. In the case of the new Verizon-iPhone scuttlebutt, there are four ideas I'd raise for your critical contemplation. Any one of them could be right or wrong, but again, the point is that we really just don't know. The simple reality is that we've heard the Verizon-iPhone rumor many times before. The talk swept through the blogosphere again and again in 2009 -- in fact, we saw it surface as far back as 2008. That alone is a powerful reason to remain cautiously skeptical about any new "definitely true" gospel. Following an earlier set of Verizon-iPhone rumors last spring, the carrier's CEO told reporters Apple wouldn't likely want to bring the iPhone to the company until its 4G network was in place; the CDMA technology Verizon currently uses, he stated, was too dated and limited in scope for Apple's interests. Verizon is still relatively early in the development of its 4G network. The carrier has said it doesn't expect to reach even a 66-percent coverage level in America until sometime in 2012. Could Apple have altered its position on the Verizon CDMA issue? Sure; in fact, an updated version of the WSJ's story suggests the company "changed its mind as it realized Verizon's upgrade would take longer than expected." Believe whichever side you will, but it's one more potential obstacle to bear in mind when evaluating the latest Verizon-iPhone rumor. 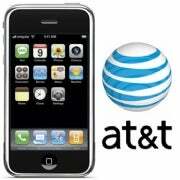 Apple's exclusivity contract with AT&T has long been shrouded in mystery. Recent reports have guessed that the deal expires sometime in 2010, but there's never been any official confirmation. Assuming the deal is set to expire this year, though -- a move that could clear the way for a happy Verizon-iPhone union -- some believe the odds of it actually ending are still rather low. Just last month, multiple analysts suggested the launch of the iPad likely included an extension to Apple's exclusivity arrangement with AT&T (or, as the satirical paparazzi put it, "Celebrity power-couple Apple and AT&T is anything but over"). This last one may sound a bit on the paranoid side, but the truth with any "leaked info" is that there's always someone who stands to benefit from the buzz. Consider the fact that since this latest Verizon-iPhone story broke, the stocks of both Verizon and Apple have shot upward, while the finances of Research in Motion, Palm, and AT&T have all taken a hit. Then there's the competition side of the equation: Android-based phones are simply exploding right now, and the slew of newly released options is increasingly eating away at Apple's mobile market share. A report released just this week finds Android creeping dangerously close to the iPhone's American stronghold -- and with slick new handsets like the HTC EVO 4G and Samsung Galaxy S on the way, sales of Android phones are only going to climb higher in the months to come. With the possibility of a shiny new iPhone on a slightly less evil-seeming carrier, consumers considering an Android phone might instead wait it out -- meaning competitors' sales would suffer at least through the start of summer. I'm not suggesting some kind of massive conspiracy theory here. All I'm saying is that one way or another, there are ample ways investors can benefit from a well-placed "leak." As a cautious news consumer, this is crucial information to keep in mind. Remember: Apple-oriented rumors are a dime a dozen. Only time will tell whether this one proves to be true, but in the meantime, treat the talk for what it is. Until some convincing facts are tossed our way, it all amounts to little more than high-profile speculation.